Note: click on the thumbnail pictures for high resolution images. 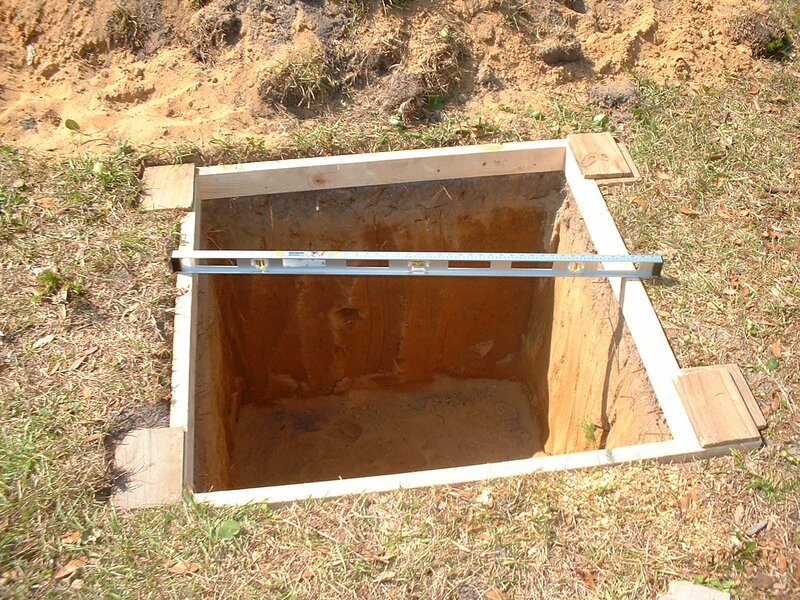 The hole is 3.5' x 3.5' x 3.5'. There must be at least 3" of concrete around the rebar cage to make sure it will not rust, so the rebar pieces are cut to 3' long. It is also important to make the hole nice and square so that sand does not get mixed up with the concrete, which would weaken it. I used a 4' level to make sure the frame (made using regular 2x4) was horizontal before pouring, then I used the frame to level the surface of the concrete. I used 5"x5" pieces of wood (fence piquets) in the corners to keep the frame square. They also make it easy to adjust the frame so that it is horizontal. 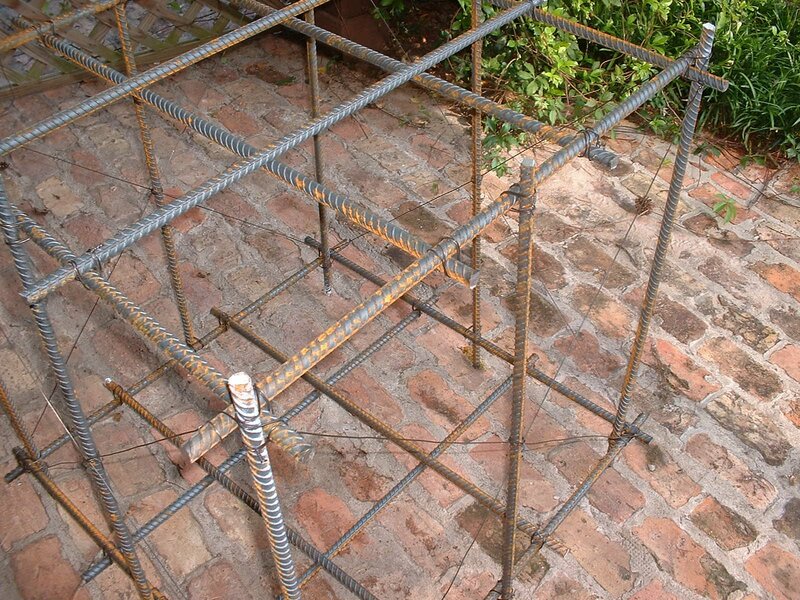 The rebar cage is made of #5 rebar (that is 5/8" in diameter). It is not difficult to cut with a hand saw as long as you have a good blade. I bought 10' long sections of rebar and it took me less than an hour to cut all the pieces. Building the cage took about an hour and 1/2. 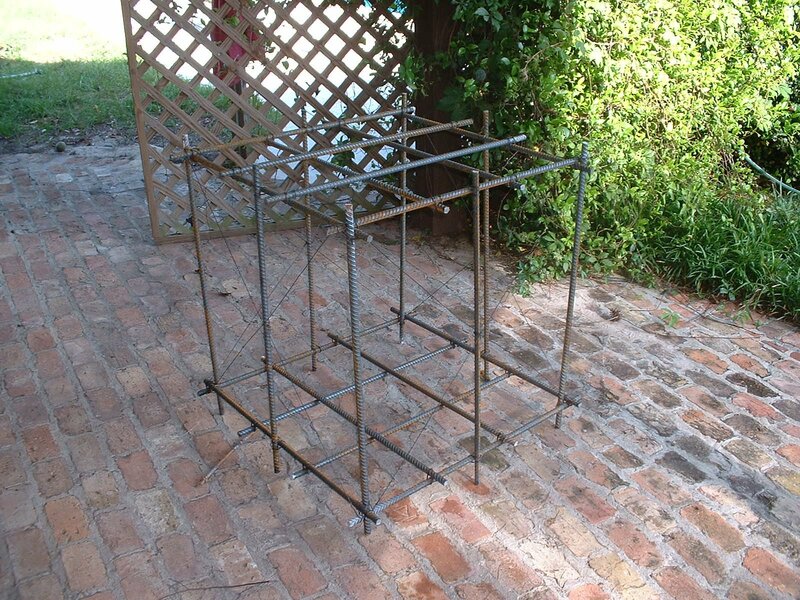 Note the stiffeners (look like large X) made using rebar tie wire on the four sides to keep the cage square while being manipulated and installed in the hole. Some people have the rebar cage welded, which certainly does the job. However, welding weakens the metal and makes it more prone to rusting, and also costs quite a bit more than some rebar tie wire. You do not need to tie each and every rebar cross point. 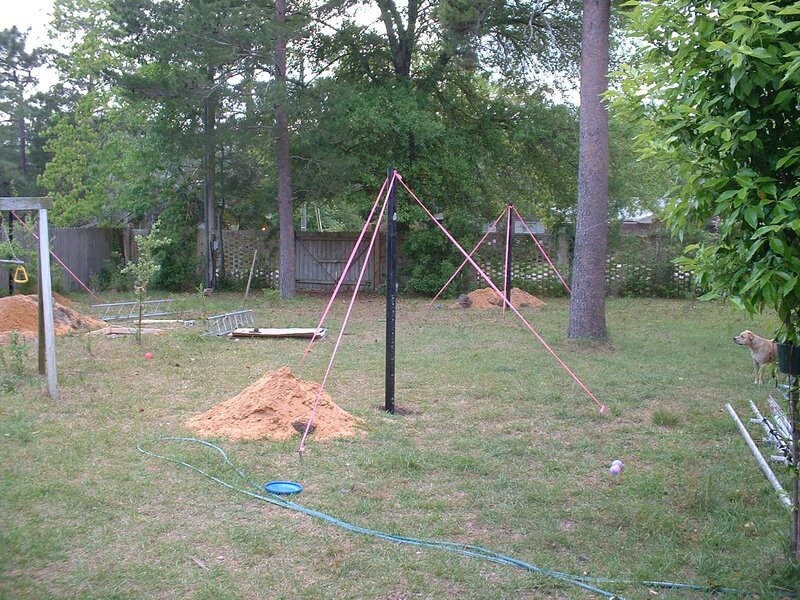 The rebar wire is only useful while building the cage. 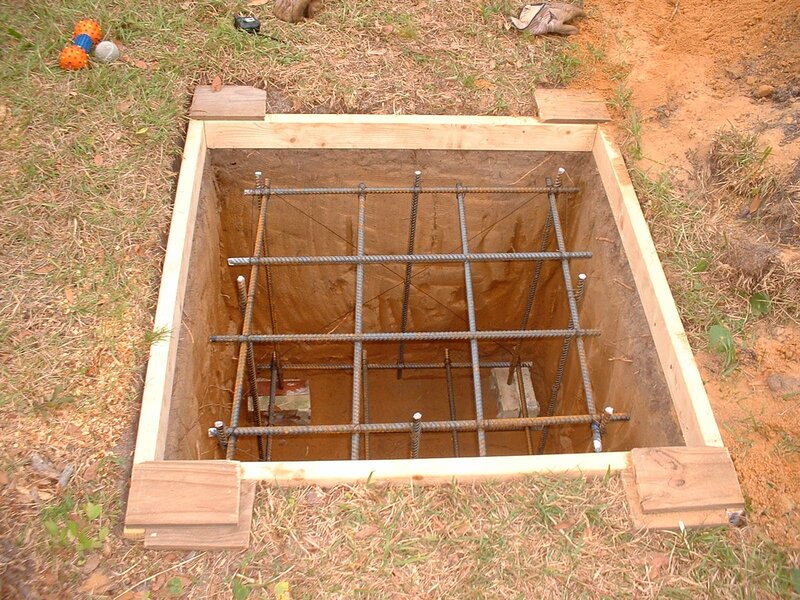 Once the cage is in the concrete, the wires have no effect, so you only need as much tie wire as is needed to make the cage rigid so you can move it and put it in the hole without the cage deforming. Room for improvement: I just laid bricks at the corners of the hole and laid the rebar cage on the bricks. I thought the weight of the cage would be sufficient to keep it in place, but I should have found a way to positively secure the cage in place as it did move a little when the concrete was poured. Note the 1' long piece of rebar in a hole near the bottom of the tube, held with rebar tie wire. This prevents the tube from pulling from the concrete. Note that I used red ribbon from the hardware store to make the wires more visible (for the kids). Also note how my dog, Spanky, was impressed! 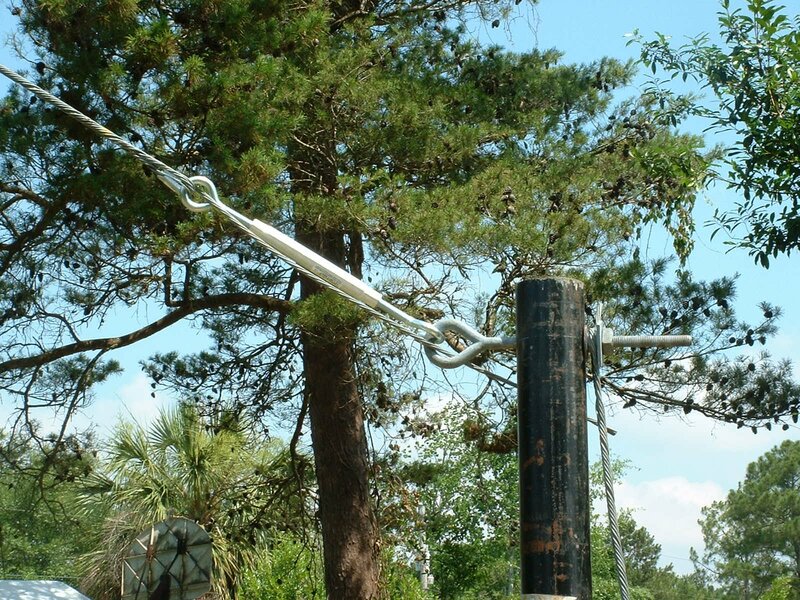 I used eye bolts to attach the turnbuckle to the pole. The other side of the eye bolt has two sets of nuts. The first nut holds the eye bolt to the pipe, the second nut holds a large, square washer to hold the tensioner cable. The other side of the tensioner cable is secured to another eye bolt, which is itself tied to a J bolt (inside the concrete) for better grip. 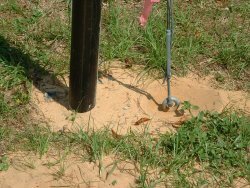 I poured the concrete up to about 1" under ground level then covered it with sand so that if and when I sell the property, it will be easier to cut the pipe and cover the concrete patch. 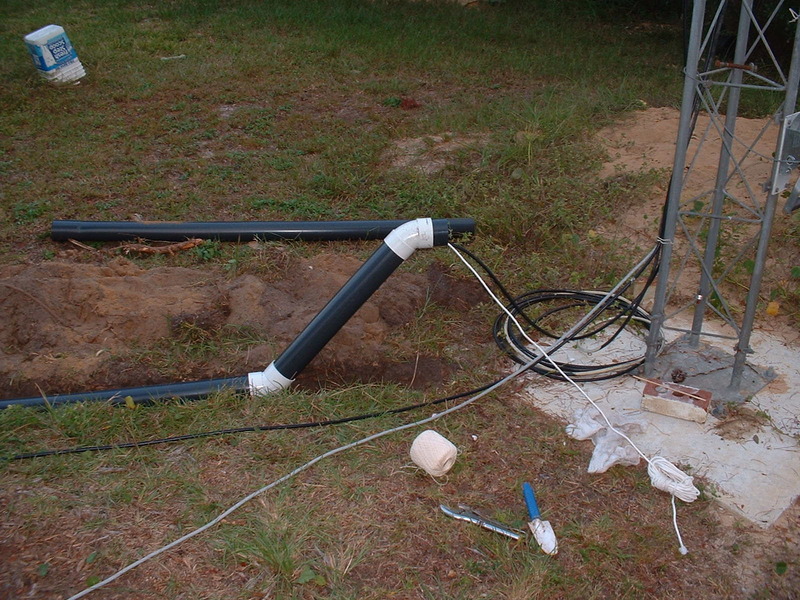 The PVC tubes carry and protect the cables to the tower. 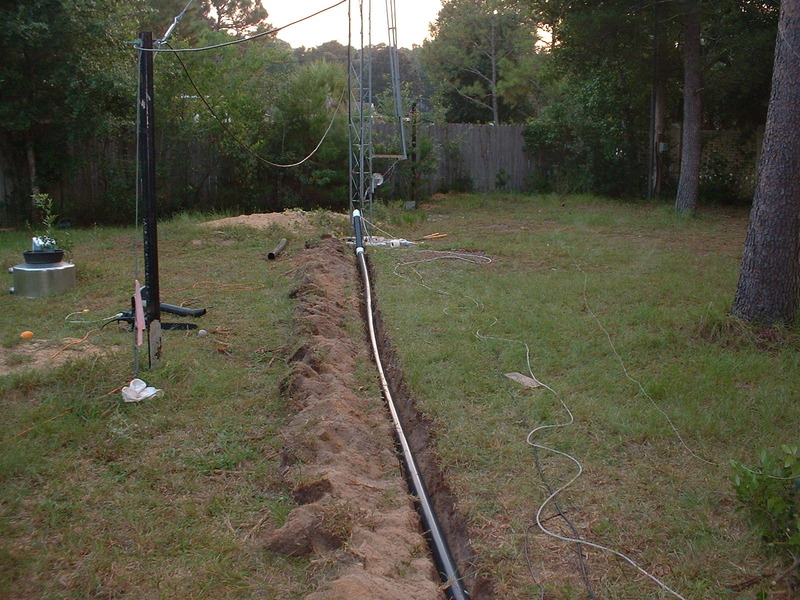 I used 3" PVC tubing from the hardware store, in 10 foot sections, with 1/8 inch holes on the bottom side of the tubes every 5 feet approximately to let condensation drip in the ground. The main sections of tube are just forced into one another without glue, but the 45 degree angles at the ends are glued for rigidity. People ask often why not make the tubes water sealed? The problem is that you cannot completely seal the ends, and with normal temperature and atmospheric pressure variations, there will always be some air circulation in and out of the pipe. 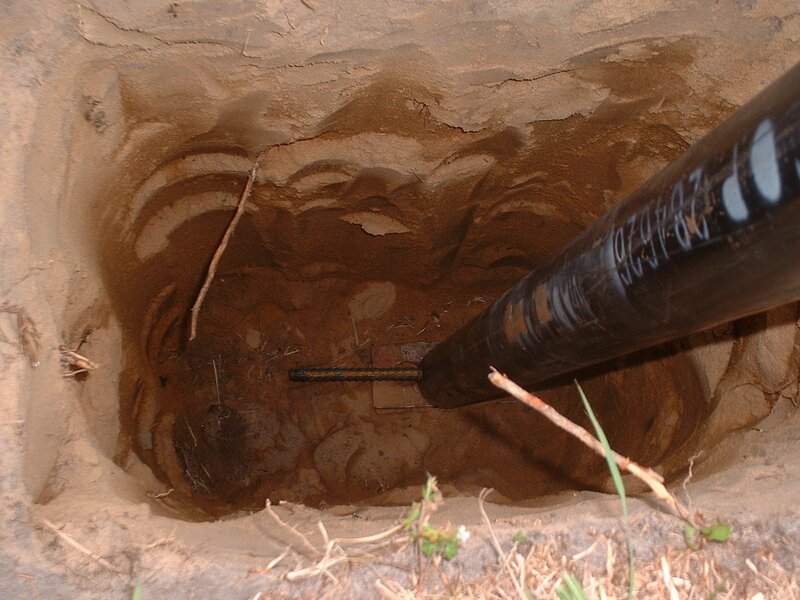 As a result, moisture tends to accumulate in the tube and eventually condense into water, in which the cables would lay, days after days. 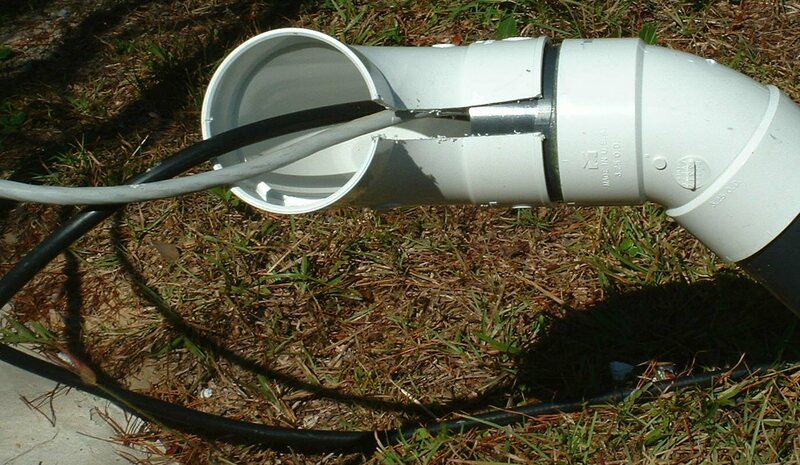 The PVC tube ends use 45 degree bends to make it easier to snake the cables through. I then attached a stronger rope (at least twice the length of the pipe) to the twine and pulled the rope through the pipe. From that point on, make sure you do not let the rope end back in the pipe. It is hard to push rope through 50 feet of tubing, and once you have a few cables through the pipe, the piece of polystyrene pushed by the leaf blower may not do the trick. 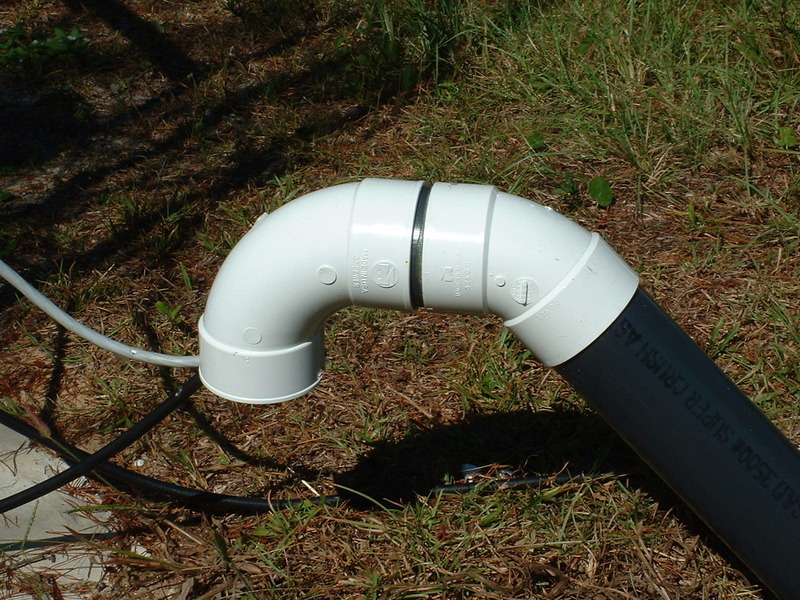 The 90 degree bend at the end of the pipe prevents rain from entering the pipe. It is not glued since we are not trying to make it waterproof, but convenient. Do not forget to stuff a rag in the pipe to prevent critters from entering the pipe. A local ham had the hardest time getting a rodent out of his pipe. It did so after significant damage. In this picture, I have rotated the 90 degree bend to show the 3/4 inch wide slot underneath, to easily remove the bend when you need to run more cables. The slot has little effect as far as rain protection is concerned, but makes it very convenient. The winch used to raise and lower the tower. It seems this device was made for boat trailers, it does a good job raising the tower, even though it is quickly fastidious if you have to do it more than once. The major problem of this particular type of winch is that it is not self-braking. 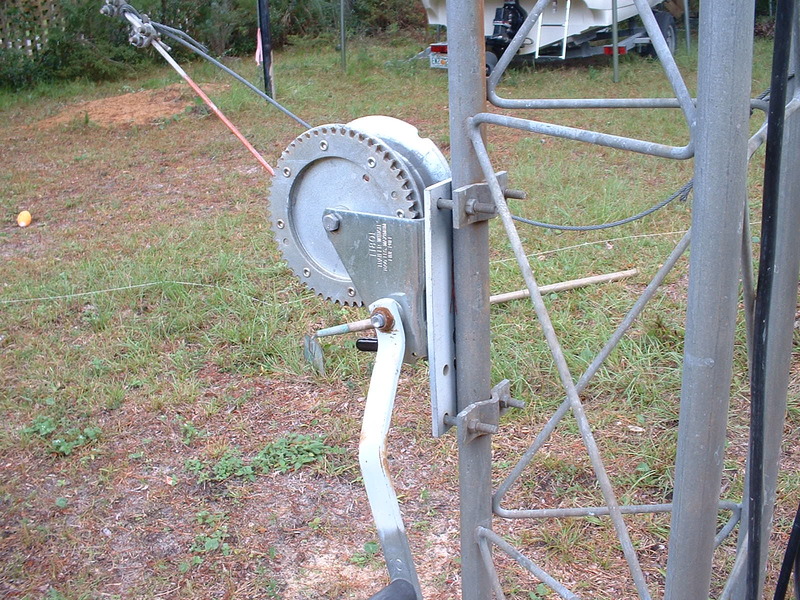 When the upper part of the tower is horizontal, there is tremendous weight on the cable, and if you accidentally let go of the crank, great damage to the antennas, tower and rotator will result. 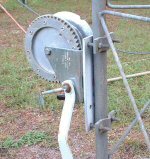 There are self-braking winches ( Dutton-Lainson is one vendor, link thanks of Mahlon K4OQ), www.farmtek.com is a distributor (thanks Doug NX0N).